Ah, the time has come. I have to leave Japan this week Thursday. As I came to Japan for client meet and product demonstration purposes on a business visa, now to work here I’m undergoing the Work permit process. Actually got the Certificate of Eligibility (COE) from the Japan government, but wanting to apply the work visa from India. 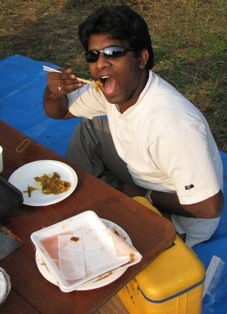 I would have been applied the work visa from Japan itself, but this is a reason for me to visit India. I feel home sick now, anyway for another 15 to 20 days I will be out of Japan. This is the primary reason for not been able to update the blog for couple of days. Lots of purchase and preparation for the visit back to home country made me really tired. Also in the work place I had to type lots of documentations made my fingers go red. In fact I also had plans to visit Tokyo Sea Life Park last Saturday; unfortunately the baggage preparation took my whole week end. I’m pretty sure now I won’t be able to post anymore blog in this trip in Japan. Hence making this Bye Bye Bye to Japan as last blog in this trip. I hope to spend my holidays in some places in Karnataka or Kerala states of India during my holiday out there with my family. I will try updating this blog at least once during my stay in India. arikato, arikato gosaimasu and Thou arikato gosaimasu are Thanks, Thank you and Thank you very respectively in English are Japanese words most pronounced among Japanese people. Sumi masen means excuse me; you need to know this to get japanese attention during the busy hours train journey to get way for you. Not only that for many places like asking for a path or information from a station master you can use sumi masen as sorry or excuse me. Thou chou means Sorry; you can use this instead sumi masen too. Based on location you can change between sumimasen and Thou chou. ‘Hai’ and ‘So’ in Japanese means yes in English. Some times when a person next to me says hi to somebody takes my attention as I used hi for different purpose don’t we? ‘iie’ in Japanese means no in English, the pronunciation of nei is similar to saying nai in Hindi language. ‘Ah So’ means Is it what sounds to me. ‘Mush mushi’ is another word used very commonly while attending a phone call, this means hello in English. Adding ‘ne’ in the end of conversation soften the phrase, hence you can hear sentences ending with the sound ‘ne’ very frequently. Othskare Samidesu is widely used to say work has finished, leaving for the day etc. You can see people saying this while coming out of toilet, after smoke, after work leaving home and even after food or tea. Ohaio Gosaimasu says Good morning, if you look at some of the phrases the Gosaimasu will be prefixed. It is nothing but a word for wish. Othachiwa means I am when you wanted to say I’m Siva(replace with your name), you need to say Othachiwa Siva desu. Looking at this you would have found desu is prefixed to make the proper form of saying I’m Siva in Japanese. Yoi sumatsuwo ne; the sentence says that Happy weekend to you. Sumatsu means week and sumantsuwo means weekend. Yoi should be happy and ne to soften the phrase. Actually you can get more for every 100 yens you spent on a 100 yen chain shops in Tokyo. There are 3 different categories of these 100 yen shops. The first category is the common one that sells utility items like vessels, bags, umbrellas, bottles, gardening items and stationary etc. Not only that even tea sets, couple of chopsticks and make up kit are also part of their product lines available for sale. I was always a great fan of 100 yen shops as it provides some value for money. In 100 yen shop one can even take personal clothing and foot wear also. The most attractive stuffs in the 100 yen shops are the hardware tools. I always wanted to carry as much as them with me while going back to India. Unfortunately the baggage weight may jump double if I do that, hence couldn’t buy most of them. The second category is the shop 99, this is also a kind of 100 yen shop but for food articles. Like a normal grocery shop. Many of the items are with in 100yens, but they do sell some items above 100 yens you can find the price tag for those items listed in the racks. This is where I used to buy thing to run my life in Japan. If you are worried about staying in Japan with cost effectiveness find a place where you can get all these 100 yen shops nearby. The third category is not so popular and finding them may turn puzzle game played experience to you. These are the shops which are not available in many places but if you search for it in major shopping areas, you may find these shops inside another shop. They normally share the space with another shop I guess, to provide you the best rate for the items. I prefer to buy the souvenirs from this 100 gift shops. They have plenty of options for souvenirs like Japanese stone lanterns, laughing Buddha, Japanese ceramic items, the traditional masks, small dolls, Lucky cats and so on. Don’t worry they do provide minimal electronic and electrical items for 100 yens like Torches, Cigarette lighters, cassettes, CDs, DVDs, clocks and calculators. One of the 100 Gift shop I found is near the Electronic town exit of Akihabara. I could purchase some articles from this shop for 100 yens which was tagged more than 1,200 yens in Tokyo tower and Asakusa shopping areas. If you are a person who is not a brand specific shopper, then the 100 yen shops are the digest you are looking for. The work visa process includes 2 major tasks, one is to get Certificate of Eligibility and other one is to get Work Visa and Alien card. Carry minimal 2 photographs for the COE application along with the sponcership details and the employer details, normally you will be instructed to bring lots of paper along with the COE application. The work visa needs another 4 or more photographs. Hence if you plan to apply work visa from Japan while visiting in business or other short term visa status, carry the couple of passport size photographs handy with you. You will have to provide all your Education and Service background proofs to apply for COE. While applying for COE you will also need to produce your original Academic certificate along with the application, the same will be return to you after verification during the application submission day. The COE process takes about 1 month to 2 months due various reason, hence it’s advised consider making the COE plans earlier if you are planning to work in Japan. Once getting the COE then the process of Work Visa starts, the work VISA could be obtained for a maximum period of 3 years. However it depends on your employer and kind of employment you are obtaining. No one can work in Japan without a proper work visa. Once the work visa is obtained the you can enter in to Japan as a long term migrant. During the entry to Japan with work permit, you will be obtaining the Alien card. That will be used for your identity purposes. When you stay in Japan in a short term visa you need to carry the passport all the time. Where after obtaining the Alien card you can carry only the Alien card for the proof of your stay in Japan. The Alien card helps getting your Tax sheet, Drivers License and Insurance. If you are in Japan on a short term visa and during your visit if you find a job in a Japanese company, you will be required to apply for work permit/visa. If some reason, your short term visa is nearing or expiring before you get the certificate of eligibility, you will be asked to leave the country and apply the work permit from your home country. Suppose if you get the COE before the expiry of your short term visa status, then you can apply for work permit from Japan itself. In this case after applying to the work permit/visa before getting the long term visa status in your hand if the current short term visa expires; you can still stay in Japan provided you should hold the proof for the current work permit application process. Feel free to get in touch with me, if you want more information on this regard. 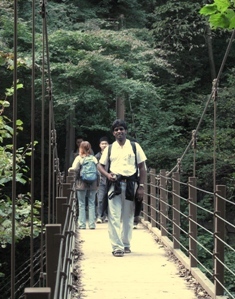 Vipin (an Indian friend) and me had plan to have a trekking experience in Japan; for a long time we have been thinking of Mt. Fuji but we could never make it. After a long search on the internet we found the mountains in Kanto region, filtered the results with a constraint for easy reach from Tokyo that gave the target Mount Takaosan. I also read about the autumn season and the maple leaves of the Takaosan Temple. I was really impressed by many articles on the internet about other's experience with the Mt. Takao. Last Saturday morning we took the train from Shinjuku station in Keio line which operates trains to Takaosanguchi station. The Keio line starts in Shinjuku as a subway and soon after one or two minutes it comes out of the subway tunnel and runs on the open rails. Hence I liked the train which showcase me the Tokyo suburbs. Takaosanguchi station is just below the Mt. Takao. The trekking trial starts exactly from the station entrance. 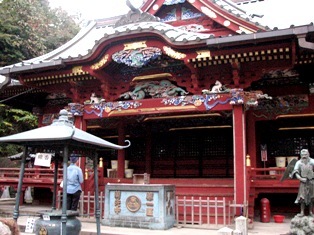 There is a large size red colored dori (Traditional Japanese arch seen on the temple entrance) erected outside the station in Takaosanguchi. Mount Takao is not a tall mountain. But walking on the trekking route provides lots of fun as we moved in to the wild and steep path. 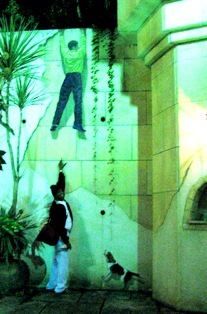 There were three different mountain climb routes started immediately after the station entrance. There were two more routes that are braches for the main route. I got to know these information from the broachers put outside the station. It has lot of information about the attractions but you should know Japanese to understand. I used my intelligence to find the important things by looking at the pictures provided. There are totally six different routes which takes us to the top of the mountain. After carefully reading and seeing the broachers (most of them were in Japanese, hence I was requiring help from others to understand the route) we have selected the route which goes with thickest nature way touching the Takaosan temple. Actually it doesn’t go via. the temple but a few meters away from the temple the path takes a wild route. We can enjoy the core of the nature, the dark green forests while your wet breath fills the air. Another main reason to select this route is that I have seen a rob bridge (hanging bridge) shown on the broachers on this route, which attracted me largely. The route which we have selected seems to be bit steeper than of other routes, however for the convenient of elderly and fun lovers the local authorities have arranged a Cable car and Chair car provisions to go up to Takaosan Temple. The cost for one way travel is 470yens and for two way its 900yens per person. I liked the Chair car stuff a lot, 2 people in a chair that hang and move on a cable assisted with giant winches to climb the mountain halfway. As we decided to trek on the mountain, we didn’t choose the cable stuffs. 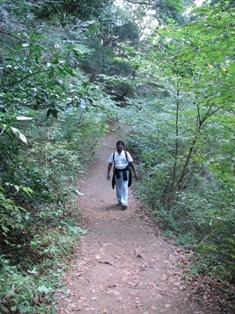 The trekking experience in the wild forest was a thrilling experience, many places you can see the path goes very narrow. One side of the path slides deep into the mountain with thickest forest. The path was bit slippery due to the moisture and really a dangerous movement in couple of places. But to my surprise lots of Japanese with kids have came on the same trekking route which we have selected. I have seen even the elderly women and men eagerly trekking alongside with us. During our walk we reached the hanging Bridge and took some pictures over there, looking at the surrounding of the bride gave us fun as it built on top of a wild water canal. Though it connecting a valley and on top of a canal but the season is autumn and there was not much of water in it. A thin line of natural mineral water flows in the canal with chal chal chal sound. I think this is the same canal which ends in the bottom of the mountain as small water falls; it was just before the chair car station bottom of the mountain. In some areas of the path, we could get beautiful Ariel view of Tokyo, I didn’t forget to bring my binocular it helped me in this trip. In many places the local body has installed information boards about the animals, birds and insects found on the particular area of trekking path. Unfortunately it was not useful to me as every single letter was in Japanese. It would have been better if they put some English information to promote and encourage tourism and tourist respectively. While walking over the wildest mountain we met couple of people, importantly an old Japanese group of ladies who offered us chocolate candies. They discussed with us in minimal English about our work etc. I have not missed to take a picture with them : -) After a while we have reached an area which turns intersection with three more other paths, from there the travel to the mountain peak is joined and mixed with all the people. 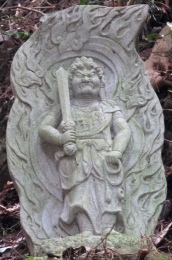 I also noticed during my walk that every 50 meters of the routes were installed with some statues of local gods and Buddha. Also I noticed the Japanese have some holy tree and stuffs like that inside the forest. Later about 4:00pm we have reached the mountain top, as expected nothing was there on the top, but it was crowded. The west side of the top was getting ready for observatory I guess. There was a machine which does some civil construction work to provide barricade. I forget to tell, till the mountain top the automobile are able to reach, but not those of general public but of the local authority’s vehicles. We have seen the sun set from the mountain top and started getting down. While going down our aim to visit the Takaosan Temple. Hence we moved towards the route on our target Takaosan Temple. Soon after few minutes walk we have reached the first level of the Takaosan temple. I think it has four levels, each level is having a temple for different god/goddess. From the top, the first level temple is relatively small and going down you will see bigger sized temples. Actually now the sky became too dark stopping me to take pictures, as I have not carrying my tripod I was really felt too much disappointed. During my trails taking pictures in the 1st level I met a Brazilian lady who was so kind and chat with us for few minutes. I didn’t forget to give her my email id and website address to invite her to my site and friendship. The temple in second level is really good one with lots of wooden sculpture and pain work. All of these temples were painted with red color and the carvings with multi color paintings. This temple is a must see spot in the Mt. Takao; unfortunately I lost the light before reaching the temple. I wish the temple authorities provide good lighting in the evening to highlight the temple. Finally I reached the main Takaosan temple which is in giant size and brown in color, the entrance facing towards downwards of my trekking path had two god statues with angry face. I have seen similar stuffs in Asakusa and other temple visits in Japan. When I was trying to use the tiny flash to take pictures of the temple, there was guy who came near to me asking me not to take pictures. It was strange to me, as he stopped only me but others. Now the entire environment turned dark and moon on straight line of my eyes. It was good walking on the pavement towards downside of the hill, in some locations I heard the wild monkey fighting sound and some ku ku ku ku.. Kiiiirriichhh Kiiiirrrrich noise. After a little walk we reached the cable car mountain station,　As it turned dark I decided not to walk anymore and decided opted to take he cable chair facility. So I could hang on the chair while moving down top of the forest in sitting position. Unfortunate awaited to disappoint me again, the cable car staff has conveyed me that the cable chair facility ends before 5:00pm, when he said that piece of information to me the time was already 5:30pm. Hence we had left with no option to choose only the cable car. It was nice too traveling on the step modeled cable car. It reached real quick to the bottom of the mountain. We walked towards the Takao station and had 20mins time before the Rapid train departure,　so decided to walk on the local roads to see anything interesting to us. Luckily we found a Trick Art Museum which exhibits lots of art work that trick to fool you of thinking the images are original people. Those were really cool to enjoy, they charge a minimal of 200yen as entrance fee to get in but lots of the pictures are visible from the road itself. After few minutes of watching, I have ended my trekking day on Mt. Takao and railed on Keio back to Shinjuku. From where I took my subway Oedo Line back to my Apartment. During the Barbeque party on Friday, after one of my friend told me about the river valley next to the park. He also hinted to see me the activities around the river valley and stated that this is how most of the river side valleys in Japan have been used. I was excited and took my camera and walked away from the party place. Actually the river was in the other side of the road, where the road was constructed in an elevated place in between the park and river. Hence I climbed up on the steps to catch the road and crossed it to go down in to the river bank valley. The river was bit away from the road but the valley was filled with lots of games and sports by people. I think that was a internet school base ball tournament, colorful uniforms wear children playing the baseball and their coaches around boosting them on the game. We in India do not have the game Baseball but Cricket the one which is most famous and crowd grabber sports in India. However for me except the bat nothing seems to be different as I don’t know either Baseball or Cricket. In the other side of valley I could see some youngsters playing saucer the foot ball game, in between these to activity area in the plains a person with a Golf hitting the rough ball, unfortunately he didn’t have anybody to collect and return his balls. I went near to him to take some pictures of Golf but after seeing me, he stopped his play and started staring at me. I don’t know why but seems he didn’t like photographed I guess, however I had many other opportunity on the ground hence moved after quickly. I was looking at each sports by small kid to an old man and passing on the valley area. Finally I reached the destination river where couple of people using their fishing rods with reels fitted awaiting for their collection of fishes from the river. Since the sun was bit harsh on the day, I couldn’t click much or better pictures of the fishing stuffs but my disappointment was not lasted for long time. The river banks also had a yellowish followers with lots of Honey Bee flew on it for honey extracts, one of the Bee has reacted well while I clicked him on my camera with Super Macro enabled. At the river I saw some jet skiis ahead, it was a Friday morning and I really enjoyed looking the jet skii sport is fun on the river parting my daily rush hour commute in the subway trains. After clicking some of their adventure on my digital black box, my foot urged me to walk back to the BBQ area. My return path also pushed me to the circle of surprise as I have seen the first remote controlled miniature flight squeezing the air on top of my head. 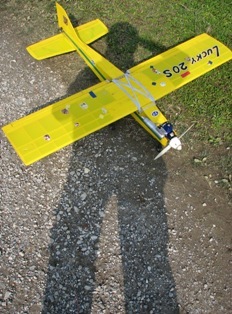 It reminded me of my childhood days, I had always wanted to become a pilot :-), and it never happened. I could only fly as a traveler in many flights. My memory shadow traveled on the same miniature flight to catch those undeleted sweet days on my brain cells. 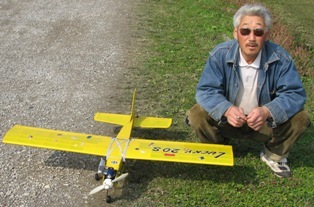 I ran and rushed near to the person who operated the remote control, the flight was brought into the valley of the river on a bicycle by a person, I tried to learn the operational instructions from the person, but my unfortunate he couldn’t speak English but managed to get his pose along with the flight. For my request to take picture with him and his flight he landed the flight from the sky, my travel back to the past also landed to the reality along when he landed the flight. My hunger stomach urged me to go the BBQ. "Almost we go out on a Barbeque party at least once in three month” quoted by Mr.Uchida who is also a well wisher and friend of mine in Japan. Almost all our travel schedule in Japan has been drafted by Uchida san. I remember a weeks back he was discussing with me about the BBQ party, I said I was interested in participating. You know as a result he came out with a BBQ party announcement to all of our friends living in Japan. Till that time I was not sure about the BBQ part of Japanese. The party was organized in a park called Shinozaki kouen in Tokyo. We reached little early in the morning about 8:00am because we were the ones carried the BBQ equipments like BBQ oven, grill, stove and some out door accommodation arrangement. As soon as reaching the park my eyes once again in Japan got stretched to express the surprise that I have seen. Initially I was thinking that the BBQ etc are western countries culture and Japan would have not into it. But to my surprise when we reached the park I found that park’s BBQ party area is divided into 27 boundaries, each hosting a group of people to conduct their BBQ party. And the important thing is that the days when we went, none of the boundaries were free and lots of people everywhere preparing the BBQ. The party place is free but needs to be booked in advance. The aged people, middle aged person and kids were all part of the BBQ parties here; everybody enjoys cooking and eating etc. Since we reached little early before everybody I started putting the chairs and the oven etc in its places to make the BBQ stuffs ready before others reach in here. Even after we prepared the setup it was not time for other to participate, because as per the announcement the BBQ starts by 11:00 am, so I decide to walk around the park outside area to explore some photography opportunity. Another Japanese friend of mine told me that there is a river next to the park after crossing the Highway. In my next blog the details of my River valley walk will be discussed for your reading. Later spending some time on the valley I started running toward the party location, this time I could see a bunch of people were carrying bag of chips and a can of warm beer with the sun roasting hides. 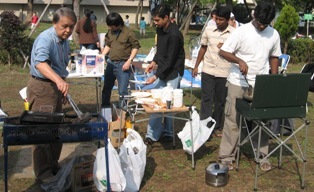 They were waiting for me, actually there were equal amount of Indians and Japanese were found on the party and for the Japanese and Indian we setup two BBQ stove and oven to make dishes from the two Asian countries. Uchida san have harvested fishes, meat and some vegetables for the party and brought those stuffs in his car. The Japanese friends started making their Fish and meat grills and some of my Indian friends demanded me to start the Great Indian Recipes to attract the Japanese around (I know the Indian recipes to an extent), decided to prepare Ginger Chicken to server with the Bread and Buns, actually it was good combination. In fact my cooking tuned to become crowd puller, as we were the only Indo-Japanese BBQ party people on the venue. Initially I told there were about 27 boundaries each hosting lots of people. The park become fun filled and lots of out door activities happening everywhere around, kids playing with flying saucers, cycling and some people on the baseball practice with their family members and so on. I actually forget to customize my preparation for Japanese, some of them looked really sweat after tasting my food; you know they said it’s hot. I know the Japanese eating habit is not spicy and they liked moderate spicy taste. So I promised to that I will prepare my next item with less spicy and salt, This time I took Kerala Chicken malsala as my recipe and the pan started boiling with me on the hot sun. Oh, I forget to mention I did carry some Indian Spice to make the BBQ with Indian Style, those were brought from Indian during my travel here, I run my daily food with these spices brought from India. My friends were really enjoying the party as many of these folks from India had no experience in BBQ party. There was a guy in the group called Anwar click some best photographs of mine during my food preparations, Being a photographer in many occasions I have made good photos of others when It came to me for my own self portrait picture I always failed but this guy Anwar made few good pictures of mine. By the time I cooked the Kerala Chicken masala there were some kids demanding the food to them to be tasted. We offered my Kerala Chicken masala prepared with coconut milk in a soba paper bowl, you know in return to the single bowl the other BBQ party guys presented about eight number of tin beer and two cups of Japanese fried noodles LOL. The party was happening with it fully swing and later we were jumped in to the ocean of Alcohol and started swimming, sailing and rowing on the few bottles of Sochu a Japanese made alcohol. We almost reached the end of day and started packing those stuffs to the car, after the run set we had taken a ride towards Noguchi san apartment who brought man of the equipment. Actually we planned to go his house to drop that equipment, after reaching he invited to his apartment hence we accepted the offer to discover the Japanese house culture treating the guests. Actually it was a good experience and Noguchi san and His wife treated us nicely, we have offered with Japanese Tea, Cake and some snacks. They had a pet dog at their house and named the dog Rokhe. Initially it was scared of seeing me :-) (color problem) but later became my friend. After about an hour stay in their house we said bye and taken the road towards Shin-Egota.